Oregonians living on a low income wasted no time applying for TriMet’s Honored Citizen fare. Since we expanded the reduced fare program on July 1, 2018, to include enrollment based on income level, more than 1,500 people have signed up. 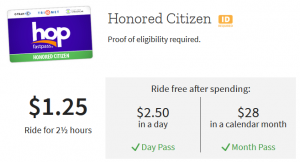 The Honored Citizen program provides a discount of 50 percent off the cost of a single ride or day pass and 72 percent off the cost of a month pass. For the average rider, that adds up to nearly $900 in annual savings. TriMet expanded the Honored Citizen fare program to those living on a low income thanks to funding from Keep Oregon Moving. The law was passed by the Oregon legislature and signed into law by Gov. Kate Brown in 2017. It’s easy to apply for TriMet’s Honored Citizen fare based on a lowincome. Participants need to present identification and proof of income at one of our eight community partner locations. Once approved, applicants receive a receipt to present at the TriMet Ticket Office in Downtown Portland, where they get a personalized Hop Fastpass™ Honored Citizen ID card. Funds can be loaded to the card at the ticket office, by calling 1-844-MYHOPCARD, at myhopcard.com or at more than 400 retail locations. Savings begin immediately. Find a community-partner qualification site near you. Honored Citizen fare offers riders significant savings on their transportation costs. Using Hop makes transit even more affordable. Hop guarantees the best price for every ride. With its unique fare-capping feature, there’s no need to purchase a pass at the beginning of each month. Just load at least $5 to the card and tap your way to savings. Once you’ve taken enough rides to equal the cost of a day or month pass, the rest of the rides for the day or month are free. Just remember to tap the card to the Hop reader with every ride and transfer. TriMet recognizes access to transit is access to opportunity. Since 2012, TriMet’s Access Transit programs – the Fare Assistance and Fare Relief Program – have provided millions of dollars in grants and discounted fares to nonprofit organizations that assist those who are struggling financially. Now with those living on a low income eligible for the Honored Citizen reduced fare program, TriMet provides safe, reliable, affordable and valued transit service to more people throughout the Portland region.